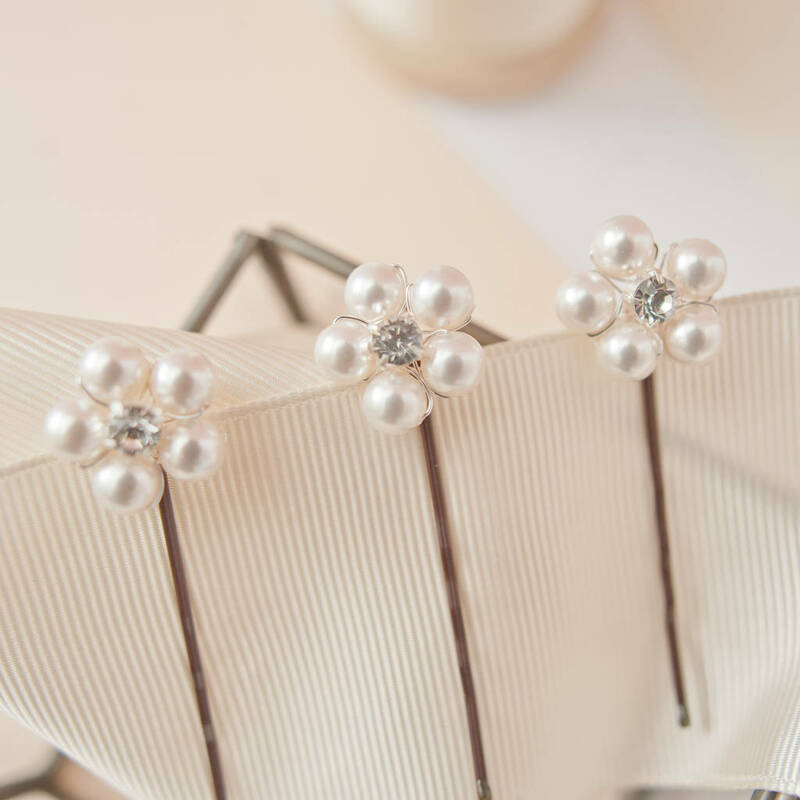 Our handcrafted flower bobby pins make the perfect finishing touch for your bridal party. Create elegance and interest with our set of three, pretty pearl flower pins, made from high quality Swarovski crystal pearls and diamante stones. These timeless hair pins can be clustered together, at the side of the hair, or spread throughout your desired updo. They also look great when mixed with other pins from our collection. 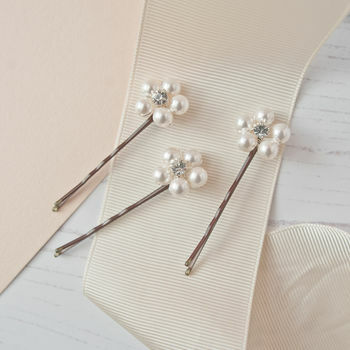 Our flower bobby pins are perfect for bridal hairstyles but are also fantastic for bridesmaids and flower girls. 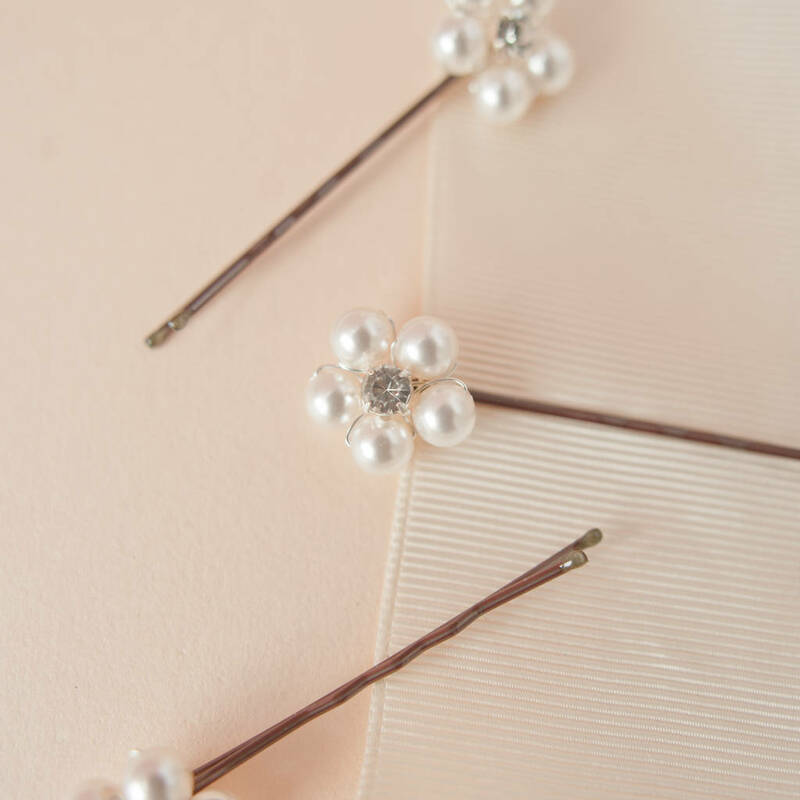 Our pins are made from genuine Swarovski pearls that have been carefully handwired into flower shapes onto brown hair slide bases. We have made these pins in using the classic 'White' shade, and clear diamante stones but should you wish to have these made in an alternative colour, this may be possible. Please use the ask a question button above to get in touch if you would like this service. Made from Swarovski pearls, diamante stones, bobby pins and silver plated wire. The pearls are 0.6cm in diamater. The pins are 4cm long. The pins come packaged in our beautiful kraft boxes, hand wrapped in tissue and wrapped with ribbon. This product is dispatched to you by Melissa Morgan Designs.